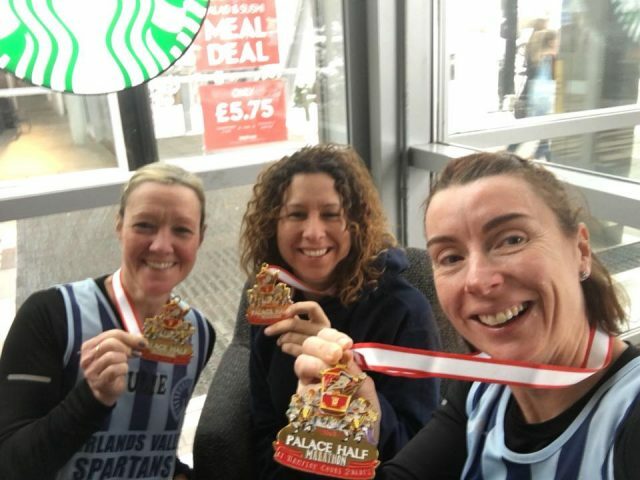 The Finchley 20, Oakley 20 and Reading Half were all cancelled by snow and ice on Sunday but the Hampton Court Palace Half Marathon went ahead and JENNY GARRETT, JULIE SHADBOLT and NICOLA TOUT headed down to take part. Conditions were tough with the cold, some ice and the last two miles on slippery mud but Jenny ran a new PB (personal best) of 1 hour 54 minutes 54 seconds. Julie finished in 2:00:22 and Nicola in 2:11:23. Chase the Moon was a midweek 10K event consisting of four laps of the Olympic Park. Spartan JONATHAN FOSTER finished in 47 minutes 7 seconds with LEE PICKERSGILL in 51:05 and SIMON SYPULA in 52:39. DAVE BOWKER was immune from the cold as he competed in the multi-county 1K race walk championship at Lee Valley indoor track. Although he was ninth out of the twelve finishers those ahead of him were from Kent and Middlesex so he won the Hertfordshire event with a time of 6 minutes 5 seconds. Karen Liddle, Tricia Hopper and Barry King completed the Ashridge Boundary Run on Saturday 17th March in 3 hours 55 minutes and 8 seconds. On a day that snowed all day and with a wind chill of -10 and ankle deep mud it was a relief just to finish. Eight Spartans braved the freezing temperatures on St. Patrick’s Day to participate in Stevenage parkrun this weekend. First male Spartan to finish was Danny Scanlon who came 9th in an impressive 19 mins and 52 secs, followed by Neil Robinson 24 mins and 32 secs, David Scott 24 mins and 54 secs, Jonathan Jones 25 mins and 50 secs, James South 28 mins and 20 secs and Steven Dobner 28 mins and 59 secs. 10th female was Karen Palmer in 27 mins and 26 secs, followed by Liz Guemache in 29 mins and 37 secs. Further afield, three female Spartans completed with top 10 gender positions. Ashley Schoenwetter was first female at Barclay parkrun in 23 mins and 20 secs, 9th place overall. Hannah Neale completed in 22 mins and 10 secs as 3rd female in Southwick Country and Verity Fisher finished 5th female at Henley-on-Thames in 29 mins and 42 secs. Others to complete outside Stevenage were John Roxborough at Luton Wardown in 21 mins and 53 secs, Nick Gill at Wanstead Flats in 24 mins and 47 secs, Michel O’Keefe at Dartford in 28 mins and 49 secs and Darryl Stevens at Brockenhurst in 40 mins and 40 secs.